Join me at the Twitter Party being hosted by "Stitchin Heaven"!!! Where: Twitter Chat, When: Tonight at 10:00 p.m. Use hash tag: #SHPARTY. I here there will be prizes!! Well, made the final plunge into the fiber world!! You can now add "weaving" to knitting, spinning, dying fiber and crocheting. I am now a true fiber-holic. I purchased and received my loom last week. I am a proud owner of a 25" Schacht Flip Rigid Heddle Loom with the stand. Merry Christmas and Happy Holidays to internet family and friends!!!!! Just joined a 2011 spin-a-long group on Ravelry. The group name is "Sweater Spin 2011. I have several 10 oz bag of this Corriedale to spin. 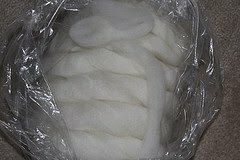 I purchased this fleece, 7 lbs. at MDS&W, May 2010. I sent the fleece out to Shari at Morro Fleece Works to be processed. I chose the pencil roving for processing. Once I get enough spun and plied, I will hand dye it. It will take all of 2011 to complete this process. As for what it will be; a pullover, vest, cardigan..I'll have to see. This is a pic of one of the BOM's that I have signed up for through Stitchin Heaven during the 2011. The pattern is named "Texas Our Texas". It include some history about the state and a bonus cooking recipe. Although I am a Virginian, I own I home in Texas. This is where I will retire. Love the weather in Central Texas. Go figure, I think I will do hand applique for the applique blocks. BTW, my other BOM is a "Baltimore Album"!! Hmmm can't wait for that one to start. Last, but not least. I will now be entering the world of weaving!! Yes, yet another craft. I ordered a 25" Schacht Flip Loom from the Woolery. It should arrive before Christmas. Pictures to follow. Just so happens, starting Christmas Eve, I will not have to return to work until 10 January....do you see where I am going with this???? OH! Almost forgot!! I am also participating in the February Ladies weater KAL hosted by "The Knit Wits" podcast. Check back often to check my progress of my 2011 Frenzy!! Do you think this is a bit much for one year??????? Let the insanity begin. Disappearing 9-patch progress report. I have pieced all of the blocks and placed it on my design wall. Now, I have to decide what type of borders it wants. Hmmm, will have to let this one marinate for awhile. Here's the pic of the quilt. Moving on, I have been seeing a lot of references related to "Mug Rugs". I have to admit, I had not heard of them before, so I researched. What a cute little quilt. It's fast and practical!!! Let me introduce you to my first "Mug Rug". The pattern, Fish Net Scarf, was designed by a knitting guild member named Toni Lopi. I hope it is a quick knit! I have 12 days to "git her done". Update on the quilting I worked on during the Friday Night Sew In. I had a small, basket quilt I made and quilted a few months ago. The quilting was an attempt to practice my free motion quilting. For the sew in, I made and applied bias binding and completed the quilt. I had some muslin and 30's fabric in my stash. I made "bow-tie" blocks. I still have a few more to go. I would like to have a total of 9 blocks. Finally, I cut 5" squares and used some 5" charm squares, chain pieced rows in hopes to make a disappearing 9-patch for the holidays. I hope to complete it during the next FNSI, 17 December. I pretty much pulled an all-nighter. Lucky I still have 3 more day off from work! 4 Days of Fabric and Fiber!!!!!!! I decided to rename my blog and url. With my upcoming endeavors for the new year, the name needed a change!! I think the name is very fitting for me, don't you think? The posts will still be all about fiber, fabric, friends, family and sometimesjust plian babbling. If you haven't noticed, please check out the new donation button for "Seamed Up" in the left column. 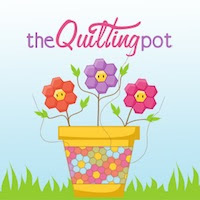 If you are a quilter, follow the blog and consider a donation... Just sayin'.